A new analysis of economic activity generated by Florida's coral reefs finds that some 70,000 jobs and more than $5.5 billion in business in the state could disappear if climate change destroys the reefs. "A business-as-usual approach to climate change could mean a lot less business for Florida," said Jerry Karnas, Florida project director at Environmental Defense Fund, which commissioned the report, "Corals and Climate Change: Florida's Natural Treasures at Risk." 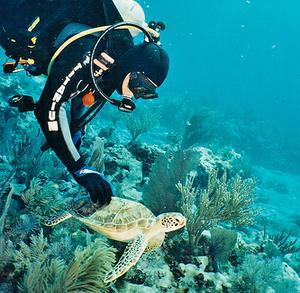 Florida encompasses the only shallow water coral reefs in the continental United States. Like coral reefs worldwide, Florida's reefs are besieged by environmental problems. For instance, a federal government study released in November confirms significant ocean acidification across much of the Caribbean and Gulf of Mexico. As oceans absorb the greenhouse gas carbon dioxide from the atmosphere, they become more acidic, reducing the ability of corals to produce their calcium carbonate skeletons. This affects individual corals and the ability of the reef to maintain a positive balance between reef building and reef erosion.